LESTARI, Tri Puji and INDRIANI , Astiwi (2016) ANALISIS PENGARUH NON-PERFORMING LOAN, RETURN ON ASSET, LOAN TO DEPOSIT RATIO, DAN BOPO TERHADAP RATING BANK (Studi Pada Bank Perkreditan Rakyat di Indonesia Periode Tahun 2012-2013). Undergraduate thesis, Fakultas Ekonomika dan Bisnis. 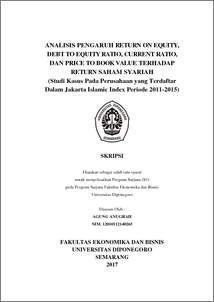 This study aims to analyze the determinants of bank rating in rural banking of Indonesia periods 2012 – 2013. There are four independents variable that used, which are Non-Performing Loan (NPL), Return on Asset (ROA), Loan to Deposit Ratio (LDR) and Operating Expense and Operating Income (BOPO), and the dependent variable is bank rating. Sampling technique used is purposive sampling, which criteria as rural bank in Indonesia who provide annual reports periods 2012 – 2013, listed on Info Bank rating, and has assets 100 – 500 billion. Samples obtained a number of 85 rural banks. The data was analyzed with regression technique. Before being tested using regression analysis, the data must first pass the test of classic assumption there are normality test, autocorrelation test, multicollinearity test, and heteroscedasticity test. The result of this study showing that NPL has negative relationship and significant toward bank rating. ROA has positive relationship and significant toward bank rating. LDR has positive relationship and insignificant toward bank rating. The last, BOPO has insignificant positive relationship toward bank rating. This research also obtained that adjusted R2 16,10%. This means that 16.10% variation of bank rating can be explained by the five independent variables.